Many times experience is the best teacher and smoking a cigar is no different. If you are new to cigar smoking, or maybe just not exactly an expert yet, listen up to our top 5 cigar tips to make sure you avoid some common mistakes. Our infographic breaks it down but scroll down for more information. Sometimes it’s easy to get bored when smoking a cigar and you start puffing it too frequently. Smoking a cigar too fast can heat up the cigar and mute the flavors as well as make your tongue and mouth feel burnt. This was one of my worst personal habits when first starting to smoke cigars. Take your time and try to take a puff of the cigar every minute at the most. You’d be surprised how long it takes for a good cigar to go out if left unattended, weather permitting. Nicotine sickness is a very real thing and can make you feel extremely nauseous. Of course you likely enjoy getting a buzz from smoking a cigar. However, if you aren’t used to nicotine, try to go for cigars with lighter wrappers. Generally a lighter wrapper means a milder flavor and not only will likely be a better fit for your palate but also contain less nicotine. Cigars that are labeled as “full” are going to be dark and their nicotine content is very high. If you do have a bout of nicotine sickness, try eating something sugary as soon as possible. Soda or candy works the best but just about anything with a high sugar content should give you relief for nicotine sickness. If you are new to cigars, chances are you haven’t had a chance to figure out where smoking a cigar is unwelcome the hard way. Sometimes just because there’s not a no smoking sign, doesn’t mean smoking a cigar there is a good idea. Nothing will ruin a good cigar faster than annoying other bar or restaurant patrons. Worst case scenario, you may be asked to leave or put out a delicious cigar. Whether it’s a beer, your favorite whiskey, soda, or coffee, having something to drink is vital to enjoying a cigar. Some aficionados prefer just plain water to be able to enjoy the flavor of the cigar only, which is always a good addition. Combining alcohol and caffeine with nicotine makes for a nice buzz but it’s also about flavor. A soda can be a great contrast to a nice full cigar. A drink can open up your palate to appreciate not only the cigar more but also the beverage. I have found this especially true with coffee. 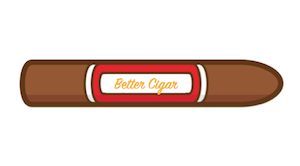 Your significant other may not mind cigars but having a plan to fight off cigar breath is always a good idea. Sometimes you can come in smelling like an ash tray and not even realize it. If you struggle with cigar breath, I would highly recommend Therabreath and a tongue scraper. This one-two punch is the best solution to cigar breath that I’ve found after desperately searching. If you want to take it a step further, plan to take a shower before going to bed if you’ve smoked a cigar. These are our tips for cigar beginners to better enjoy smoking cigars. These aren’t necessarily The Cigar Commandments but are generally good practices to ensure smooth sailing when enjoying cigars.